Bangkok – Central Pattana Pcl (CPN) has reaffirmed its position as a leading driver of Thailand’s economy with new multi-billion-baht investments in two new mega projects. The company is investing more than Bt7-billion in the CentralFestival Samui and CentralPlaza Salaya shopping mall projects, which are expected to boost the economies of Samui and Salaya area (Nahkon Pathom). CentralFestival Samui, with a project value around Bt3.1 billion, is located in Chaweng Beach, one of the most popular beaches in the world famous tourist destination of Samui, and is considered a major economic zone. Samui’s economy exhibits a growing trend every year. The Samui property market, particularly resorts for Thai and foreign tourists, is also expanding. Many leading hotels are located in the Chaweng area. Located on a land plot measuring more than 37 rai with total space of 90,000sqm, the project is only five minutes from the Samui airport and 20 minutes from the port. 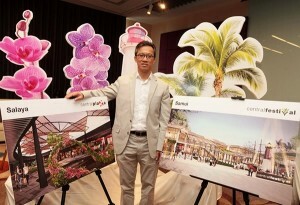 CPN’s first themed shopping mall (in resort style), CentralFestival Samui is is expected to open in the first quarter of 2014. In a bid to strengthen the company’s growth, CPN invests more than Bt10 billion each year on business expansion plans. It expects revenues to increase 15 percent year-on-year. 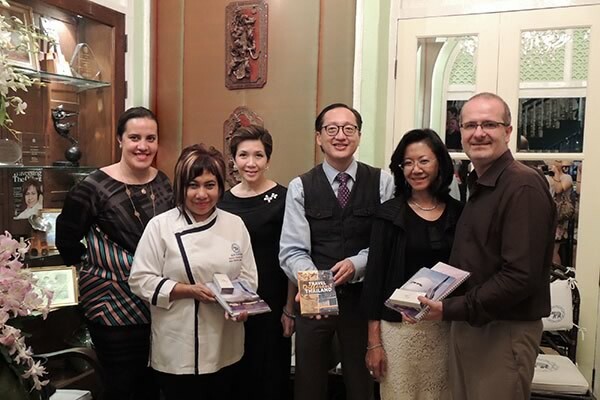 Hong Kong and Bangkok – The Pacific Asia Travel Association (PATA) and The Hong Kong Polytechnic University’s School of Hotel and Tourism Management (PolyU) released their joint publication, the Asia Pacific Visitor Forecasts 2013-2017, today. The new forecasts on the complete visitor economy will make it easier for tourism organizations to anticipate demand trends and manage supply. 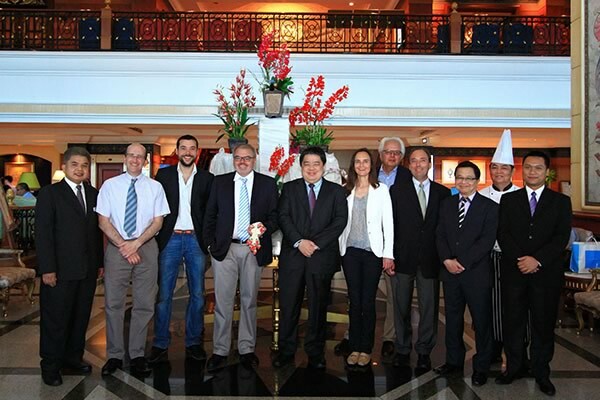 This is the first time that PATA’s Asia Pacific Visitor Forecasts 2013-2017 have been produced in collaboration with The Hong Kong Polytechnic University’s School of Hotel and Tourism Management. The annual and quarterly forecasts cover a five-year horizon (up from three) and include price elasticity variables for most of the destinations covered. High-level snapshots from the forecasts show that: Visitor arrivals to the Asia Pacific region will continue to grow with an average annual growth rate of 4.1% over the period 2013-2017 and reach 581 million by 2017; Northeast Asia will maintain a dominant position in the inbound market of Asia Pacific, and its market share will reach 53.52% by 2017; China will continue to be the top inbound destination in the Asia Pacific, peaking at 147.4 million visitors in 2017; Hong Kong SAR will surpass the US to be the second largest inbound destination in Asia Pacific in 2015; Visitor arrivals to the Asia Pacific from China will exceed 100 million by 2015; and Cambodia, the Maldives, Chinese Taipei, Bhutan and Mongolia are the top five fastest growing destinations in terms of visitor arrivals over the period 2013-2017. “I am delighted to recommend these next generation forecasts to PATA members and associates. The scope and quality of the forecasts will add value to our many different members across 17 time zones and many different functional groups,” said Martin J Craigs, PATA CEO. 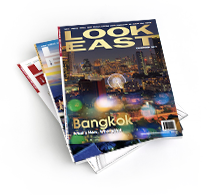 Bangkok – Thailand bagged the “Best Spa Destination (Asia)” Reader’s choice Award as voted by the readers of the AsiaSpa India Magazine, the most popular spa and wellness magazine in India, during the “6th GeoSpa AsiaSpa India Awards” held at the Kingdom of Dreams, Gurgaon, India. This is the third year Thailand has won the award (Thailand was also awarded “Best Spa Destination in Asia” in 2008 and 2009). The AsiaSpa awards set a benchmark for originality and acknowledge the finest contributions made to the budding wellness industry. Wayne Duberly (front row, far right), general manager (GM) of Centara Anda Dhevi Resort & Spa Krabi, together with David Martens (front row, 3rd left), GM of Centara Grand Beach Resort & Villas Krabi led their management teams in supporting the “100% Helmet Campaign 2013” by personal example. 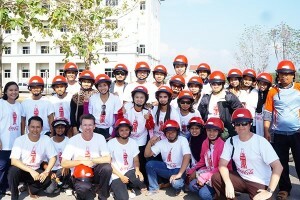 The two put on a safety helmet to show a good for example for their staff members. Thai law requires drivers and riders to wear a helmet every time their ride a motorcycle. Bangkok – Hilton Worldwide has announced the opening of the DoubleTree by Hilton Sukhumvit Bangkok, the group’s 100th property in Asia Pacific, and the first DoubleTree by Hilton branded property in Bangkok. Located in Sukhumvit, Bangkok’s main lifestyle, entertainment, and residential district, the DoubleTree by Hilton Sukhumvit Bangkok (www.doubletree.com) embraces Bangkok’s culture and vitality. The 23-storey hotel combines contemporary style and best-in-class hospitality for guests to stay connected and feel at home. The hotel features 177 modern and spacious 28sqm guest rooms, and F&B outlets such as Dee-Lite, an all-day dining restaurant serving Thai, Vietnamese, and Western fare with a focus on fresh, local dishes; and Mosaic, an energetic pool-side lounge and cocktail bar featuring live DJs on select nights. 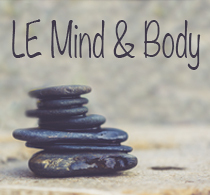 The upscale hotel also offers leisure facilities including an outdoor swimming pool and a fully equipped, state-of-the-art 24-hour fitness center as well as meeting and event facilities. Pullman Pattaya Hotel G, led by general manager (GM) Sophon Vongchatchainont (2nd left), and the management team, gave a warm welcome to Thai celebrity Woonsen Virithipa Pakdeeprasong (3rd left), famous actress, VJ and TV host, during her visit to film the facilities of this stylish and relaxing beach resort for her ‘108 Living’ TV program on Channel 5. Photo shows (from left) Kulakan Chamnankar, personal assistant to GM; GM Sophon; Woonsen Virithipa Pakdeeprasong; Nannadda Supakdhanasombat, director of marketing communications; and Marie Gonter, events & marketing director. “The Money Channel Thailand” visited the senior management of property developers Tulip Group at Centara Grand Residence Pattaya recently for an interview. Host Parichat Phromyothi sat down with CEO Kobi Elbaz and Vice President Jason Payne to discuss their ultra-luxurious, mixed-use development Centara Grand Residence Pattaya as well talked about the entire real estate sector in Pattaya. The interview also covered potential over supply in the market, the strengths of Pattaya, and future plans of the Tulip Group. The full interview was aired in May. Suraphon Svetasreni, Tourism Authority of Thailand (TAT) governor, presided over the launch of the website (www.ThailandSuperQuality.com) recently at the Siam Kempinski Hotel Bangkok. The website was developed to make it convenient for worldwide consumers to select luxurious and premium products and services from tourism operators nationwide, and to promote Thailand tourism-related activities online. Mode Sathorn Hotel, managed by Siam@Siam, recently organized a show dubbed as “Mode Sathorn Glitz & Glam Gallery Fashion Moment” to present its stylish uniforms for all the staff of its departments; and to confirm that the hotel is definitely ready for its soft opening last month. Among those who attended the show were (from left): Wuttichai Charoenkrittayawuthi, managing director (MD) of K2 Land Co., Ltd; Kla Kitchakarn, MD of Siam@Siam Co., Ltd; Nirut Ngamchamnanrith, MD of K2 Land Co., Ltd; Joompod Choowong, K2 Land Co., Ltd; Pinit Krisanavanit, general manager of Mode Sathorn Hotel; Vichai Phiphadkusolkul, group financial comptroller of Siam@Siam Design Hotel & Spa and Corporate Office; and Raveewan Rothakit, board director of Siam@Siam Co., Ltd. 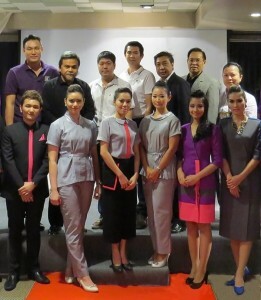 The event was held at Siam@Siam Design Hotel & Spa’s Function Six. Mode Sathorn soft opened last month. 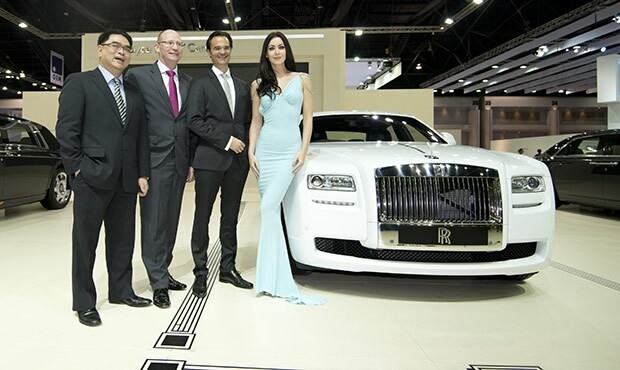 Paul Harris (second from left), Rolls-Royce Motor Cars Ltd’s regional director for Asia-Pacific, together with Chatvithai Tantraporn (left), general manager of Rolls-Royce Motor Cars Bangkok, Herfried Hasenoehrl (second from right), Rolls-Royce’s general manager of emerging markets, Asia; and former Miss Universe 2005, Natalie Glebova (right), unveiled the Art Deco Ghost at the 34th Bangkok International Motor Show. The Art Deco collection offers highly bespoke features and detailing, and the one shown at the Motor Show was one of only 35 Limited Edition Art Deco collection cars in the world. Bunport Nithakorn, general manager of Golden Tulip Sovereign Hotel Bangkok, recently welcomed Pierre Frédéric Roulot, president of Louvre Hotels & Golden Tulip during the latter’s recent visit to Thailand. 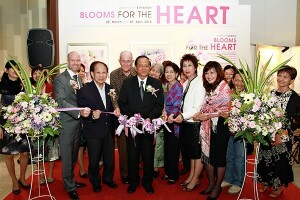 Dr. Boonchob Pongpanih (4th from left), president of the Cardiac Children’s Foundation of Thailand, Athorn Vanasantakul (3rd from right), deputy managing director finance and administration of MBK Hotel and Tourism Co. Ltd., and Christoph J. Knichel, (1st from left), general manager of Pathumwan Princess Hotel, jointly presided over the recent opening ceremony of “Blooms for the Heart,” a watercolor exhibition presented by a group of art enthusiasts, porcelain painters and art instructors founded by Boonsong Klausner (2nd from right). Proceeds raised from the sale of the displayed items will be donated to the Cardiac Children’s Heart Foundation under the patronage of HRH Princess Galyani Vadhana’s sister, Krom Luang Narathiwat. Students from Baan Nok School recently visited Amari Orchid Pattaya to join the community project called “My Day at Amari Orchid Pattaya.” The project aims to introduce students to hospitality industry based activities through fun workshops, and they were provided Breeze SPA knowledge, and taught ornamental towel folding, baking cup cakes, and making mocktails. Photo shows the students after they were welcomed by the management team led by Brendan Daly (center, back row), general manager of Amari Orchid Pattaya. Jan Kirstein has been appointed as the new general manager (GM) of Anantara Bangkok Riverside Resort & Spa, as well as the brand’s area GM with responsibility for overseeing Anantara’s six owned properties across Thailand; namely in Hua Hin, Bophut on Koh Samui, Phuket, and the Golden Triangle. 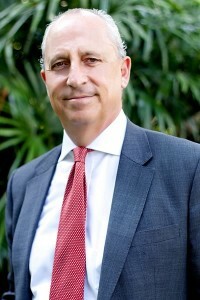 Kirstein brings with him 30 years of experience, mainly with Starwood Hotels & Resorts, in 15 locations around the world. As a GM for the past 17 years, his proven track record for financial success is accompanied by a focus on delivering superior quality and service through a hands-on management approach. 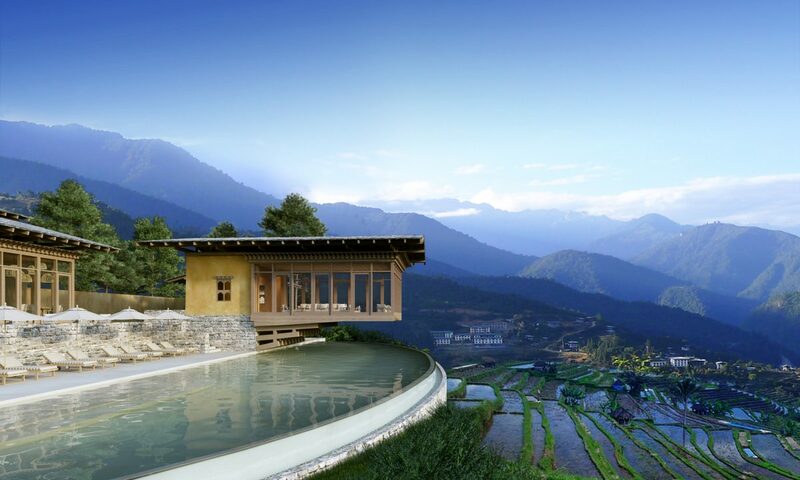 Kirstein joins the prestigious Anantara Hotels, Resorts & Spas brand in Thailand from Ligula Hotels in Sweden. Prior to this he was Group Director of Projects for Regal Hotels International in Hong Kong and GM of Regal Airport Hotel, which was voted “Best Airport Hotel in the World” by the subscribers of Business Traveler UK and by Skytrax. Kirstein has also worked at five-star hotels and resorts in Jordan, Turkey, Cyprus, Sweden, Norway, Germany, Portugal, Tunisia, the Maldives and Thailand, culminating in a multi-cultural career and a wealth of diverse hospitality expertise. Jan Kirstein is Swedish, married, and has a son and a daughter. 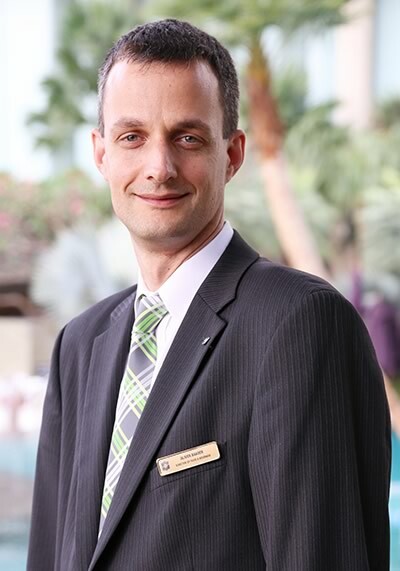 Oliver Baader has been appointed director of food and beverage at Shangri-La Hotel Bangkok. Prior to joining Shangri-La property in Bangkok, Baader was director of food and beverage at JW Marriott Las Vegas Resort and Spa. Following graduation from the Swiss Hotel Management School in Lucerne, Switzerland, Baader, a Swiss/German national, started his hospitality career in many leading chain hotels in Europe and Asia, including the Hotel Europa St. Moritz and Hotel Verenahof in Switzerland and the Regal Hongkong Hotel. 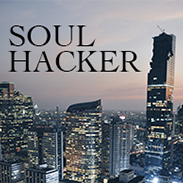 His career then took him to the U.S., where he worked in senior management positions in Ritz-Carlton properties in Florida, Michigan, Nevada, and Maryland. 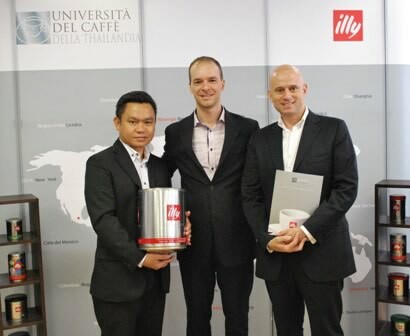 Pattaya – Tulip Group has come to an agreement with Gruppo illy to provide the world-class coffee products in their soon-to-be-opened super luxury hotel Centara Grand Phratamnak Resort Pattaya. Illy is known as being one of the world’s best coffee providers. “It’s a great coffee and not normally found in Centara hotels, but with everything in this hotel we are trying to offer only the very best, we are investing a lot of money to give our guests the ultimate experience,” said Kobi Elbaz, Tulip Group’s CEO. Elbaz is known to be a bit of a coffee connoisseur so it was only natural that the hotel would carry these products; the coffee will be available in every room and served in all F&B outlets. Centara Grand Phratamnak Resort Pattaya is expected to have a soft opening in August this year, with opening of building A. Building B will open nearer the end of the year, and will be Tulip Groups first hotel open in their ever growing portfolio Photo shows Dominique Ronge (right), general manager and Khun Pisutwat Donsuea (left), F&B manager of Centara Grand Phratamnak Resort Pattaya during their visit to Andrea Casali (center), key accounts manager (Bangkok) for Gruppo illy products at Italasia Trading (Thailand) Co.
Master Chef Nooror Somany Steppe (2nd left), Director of the Blue Elephant Group, hosted a welcome dinner for Mr. Richard Werly (far right), author of the soon-to-be-launched book, Travel Different Thailand, during his recent visit to Thailand, along with Ms. Petchpring Sarasin (3rd left), Vice President Corporate Public Relations Department, and Mr. Krittaphon Chantalitanon (3rd right), Vice President Product & Service Development of Thai Airways International, at the Blue Elephant Cooking School & Restaurant Bangkok. Bangkok — Sawadee Travel Co., Ltd, Thailand’s leading travel agency, has joined forces with one of world’s largest travel agency franchises, International Lufthansa City Center (LCC), as its Thailand representative. Sawadee Travel is now operating under the new name, Sawadee Travel Lufthansa City Center. Sawadee Travel has been in business in Thailand for over 25 years. Now, together with the Lufthansa City Center network, located in over 80 countries, Sawadee Travel Lufthansa City Center aims to provide a globally recognized travel brand that offers a uniform, top-quality service in all locations throughout the world. “With its selection of reputable agencies, Lufthansa City Center has combined local experts with extensive market knowledge under the umbrella of a global travel agency chain,’’ said Wines. Since its foundation in 1991 in Germany, Lufthansa City Center has become one of the fastest growing international travel agency franchises in the world, with more than 630 offices in more than 80 countries. The network includes Lufthansa City Center travel agencies in Europe, Africa, Australia, North and Latin America, as well as in Asia. The Lufthansa City Center franchise chain had an overall turnover of 5.03 billion Euros in 2011. Phi Phi – Koh Phi Phi’s leading luxury boutique resort Zeavola is set to make the island one of Thailand’s top dive destinations with its new elite PADI five-star diving credentials. One of the region’s pioneering eco and luxury diving resorts, Zeavola is one of a few select properties in the world to secure PADI’s most prestigious appellation, which General Manager Florian Hallermann said took special focus to achieve. The award-winning resort perches atop the sparkling sands, verdant slopes and pristine waters of Koh Phi Phi Don’s northern tip at Laem Ton, promising guests a step back into simplicity and an unforgettable journey of relaxation, romance and discovery. Zeavola’s ‘Deep and Long Weekend Dive Experience’, available until Oct. 31, offers guests three nights of natural luxury, a refresher dive and four boat dives, over a long weekend, arriving on Friday and leaving Monday. Zeavola’s Discover Scuba Diving (DSD) is a four-hour program with a PADI Instructor by your side all the time, first introducing you to the basics of diving knowledge, skills and equipment, and then taking you to experience the beauty of a tropical coral reef. For those wanting an extra challenge, Zeavola offers a Scuba Diver course (2 days) or Open Water Diver course (4 days). All dives are guided by PADI Dive-instructors and use custom built speedboats, or long tail boats, in small groups of a maximum of eight divers with well maintained Scubapro BCDs and regulators. The resort offers its own dive boats; five-star dining, service, and amenities; the island’s most unique spa; a really romantic, ‘back to nature’ ambience; and an absolute beachfront location on one of Thailand’s most beautiful islands.